Wildcat asked people in several countries to write down observations about social effects of the crisis. The following is a report from London, written in November 2008 with an update at the end. "The real crisis-effects are only just starting..."
1. What are the social effects of the crisis in your region? Electricity, gas, water supply and public transport prices in particular, along with land prices and rents, had been rising at much more than the official inflation rate for years before the same happened with basic foods earlier this year. Simplistic supply-shortage reasons, often in environmentalist or geopolitical language – peak oil/nasty Russians hoarding their gas – were given for the energy and food increases, but of course the user charges didn't when the underlying commodity prices did. It's also important that these price rises, which affect the poor disproportionately, didn't appear officially as 'inflation' – and consequently didn't influence wage bargaining – for a long time, generally until the food/commodity price shock this year. This was partially because these things are excluded from 'core' inflation indices because of their 'volatility', and partially because within these indices they're offset by falling prices of less essential things like consumer electronics and telecoms services. So ongoing social effects, such as people being pushed out of central London as the proportion of their wages spent on rent and utilities rises, have kept getting worse, but this was definitely already going on during the 'boom' phase. I suspect that the real crisis effects are only just starting, and will really begin to be noticed by workers in 'service' sectors like the one I work in (press cuttings agency) over the next couple of years, in two or maybe three waves. The first part, which is already underway, will be mass redundancies, job-competition and downward pressure on wages/conditions in the 'services' that until now have fed off financial flows into the country which L.Goldner proclaimed "the most decadent in the world". A very simple example: my employer's biggest clients were Lehman Brothers and Merrill Lynch. A lot of workers in entry-level clerical jobs like mine who imagine themselves as 'skilled professionals' are going to have to reconsider their position. Not that I'm laughing, given the proportion of part-timers' income in these jobs that essentially comes from piece-work. But the worst impact will probably be in jobs where wages, conditions and security have already been 'traded' down to a minimum against relatively easy availability of employment, so that there's nothing left to 'sacrifice' while staying above subsistence level: retail, table-waiting, removals, cleaning etc. It's also likely that the damage already done in these sectors has been obscured by statistics, given the amount of informal work and the immigration irregularities involved. The second wave will come a bit later when the 'emergency' public borrowing and spending is 'paid for' by the state and fiscal restrictions are reapplied. In official terms no 'new' spending has been authorized: the money is simply being spent earlier, to be made up for by cuts or taxation (highly unlikely unless through regressive taxes like Council – i.e. poll – Tax or VAT) within the next few years. This will hit the very same people who have already lost the ability to subsist adequately through wages and/or credit, as state benefits are cut and access to public services is reduced. The possible third wave I referred to, which could come at any time, would occur if, as seems likely, the highly leveraged privatecontractors to which so many state services have been outsourced, suffer their own private funding crisis. This would be particularly dramatic in 'public' housing, where most of the state sector has been transferred to private 'social' landlords (see answer to question 2), who have to obtain credit commercially. Problems of this kind are just starting to emerge in France, where rent-controlled landlords bought 'interest rate swaps' from the protection rackets of Calyon, Natixis, etc. It's not just housing, though: almost all of public transport and much of the medical system, the benefit system (including 'workfare' enforcement), education, sundry municipal infrastructure (even parts of the military! ), is run through the same 'Private Finance Initiative' scheme, whereby the state indebts itself for decades (thus keeping immediate 'spending' off the books) to a private service provider, which obviously has to arrange and rearrange its own credit. In all these areas, tougher credit and commercial conditions for the private contractors will mean cuts to 'public' services and higher user charges, once again disproportionately affecting those who can't afford to buy their own private alternatives. 2. Are people indebted? What is happening now? A lot of what is happening to people now, or what they fear is starting to happen, in terms of indebtedness and insecurity looks like the inevitable outcome of the way consumption and individual upward social mobility have been maintained by credit expansion during deindustrialization and flat/falling real wages since the 1970s. Maybe that's a banal observation, but I'm thinking in particular of two things consistently pushed by UK state policy since 1979: the demographic shifts towards home 'ownership' and private pensions. Even leaving aside the more recent phenomena of mortgage securitization and borrowing against rising house prices to supplement wages, a bank-lending crisis would not mean impending homelessness and total dependence on maintaining existing 'career tracks' for so many wage-workers if the proportion of the population in state-owned rented housing had not fallen from something like 60 per cent to around 20 or 25 per cent, with the difference made up almost exclusively by mortgaged 'ownership', long before any importation of full-scale 'subprime' scams. Probably more so than other 'crisis' phenomena, this is clearly a matter of political policy, engineered since the Thatcher period through a subsidized 'right to buy' for state tenants, with municipal councils banned from using the proceeds to replace the public housing sold, along with a drastic reduction of entitlement to tenancies and, more recently, transfer of remaining state housing to private sector landlords, effectively threatening tenants with much worse conditions if they still won't exercise the 'right to buy'. The situation is similar with pensions, where the deregulated explosion in the range of 'investments' offered has been accompanied by the reduction of state provision to the barest subsistence level. The present government also plans 'compulsory saving' (i.e. gambling) through forced transfer of a portion of wages to market-invested 'individual pension accounts'. It seems worthwhile, given recent debates about the degree of 'capitalist agency' involved in 'crisis' phenomena, to emphasise these ways in which workers' individual interests have been bound to those of financial markets as a matter of long-term public policy. 3. Are there any debates about the increase of cost of living and crisis? What are your perceptions in regards to that? Do you observe common developments? Hard to say in general terms. People I know well are hardly a representative sample: a few are attempting quite detailed analysis or criticism, while others tended to regard the long-running 'credit crunch' story as just another ideological/media sideshow, or in any case something mainly affecting 'owners' of things like houses and credit cards. The idea that falling house prices are a terrible thing met with an unsurprising lack of sympathy among those constantly struggling to stay in inner London in a context of rising rents, gentrification, public housing bureaucracy, crumbling squats etc. More widely there seems to be some nostalgia for social-democratic 'common sense' (although this has been an ongoing theme since I grew up in the Thatcher/Reagan period), and some vilification of 'a few greedy bankers and hedge fund managers'. One of the most depressing things, although it's also nothing new, is the widespread assumption – and not just among the middle class – that proletarian status without the redeeming prospect of personal upward career mobility is essentially something shameful and/or disastrous. This premise is shared both by 'left-leaning' social democrats, community activists etc., who lament that the 'socially excluded' and 'training'-deprived are denied the opportunity to 'better themselves', and by outright reactionaries (mostly young and 'aspirational' themselves, it seems), who blame 'failure' – i.e. lack of individual upward mobility – on the laziness, lack of 'initiative' or stupidity of those concerned. Another ugly development was the attempt by a government spokesman to use the crisis as a pretext to propose even tighter restriction of non-EU immigration, despite evidence of a mass outflow of those migrants whose numbers have actually risen in recent years, i.e. those from inside the EU. It remains to be seen whether this kind of idea will pick up much popular support outside the minority who object to immigration for national/cultural/racial reasons rather than because they misconstrue the causes of real pressure on wages, jobs and state services. 4. Are there actually already struggles happening on this front? Very little so far in the way of struggle against specifically new developments. This may not be surprising at this stage, with the wave of redundancies only just beginning - 25 percent of bosses surveyed by the FT said they were planning to lay workers off within the next year, far fewer had already done so. A lot of the job losses (or just reduction in intake) so far seem to have been in casual, sometimes informal, 'service' work, where chances of collective struggle are very low, and the lay-offs themselves may not even be reported. There's been some indication of a lot of casual workers returning to the new EU states, however short-lived any labour shortage there may be. It remains to be seen what will happen when the cuts and redundancies really get going, and the prospect of individual solutions starts to evaporate. Some workers may be more willing to act when the concrete effects of what are still presented as quite abstract financial events are unmistakable, but of course it may also be that the threat of redundancy is used successfully to force through pay cuts. Yesterday's 'Financial Times' has a panel of bosses and academics discussing the best way to combine these enticing options. The question of below-inflation wage increases was raised earlier on, before the 'inflationary' stage of the crisis had really even struck, when Gordon Brown demanded that public sector wage increases be kept below inflation (then fraudulently – see above – calculated at something like 2 per cent) as an anti-inflationary precaution. A series of feeble and unsuccessful symbolic strikes ensued. In one of the only exceptional cases, where non-teaching workers in the education system had insisted on an inflation link rather than a higher percentage offer, the state employer was held to the deal when inflation rose above the percentage offered earlier, but vowed that so such link would be agreed to ever again. More serious strikes, eg in the postal service and public transport, have generally also regarded the restructuring and attacks on conditions that never stopped throughout the boom and crisis periods. Some of the transport strikes were successful in these terms, but in the post office a compromise by the employer on the wage claim was used to push through most of the (EU-mandated) restructuring. One final thing worth mentioning is that groups doing a kind of politicized self help work, often but not always from a class-struggle-anarchist background such, as the London Coalition Against Poverty (intervening in the benefits and housing systems), Hackney Independent/Independent Working Class Association, the older Solidarity Networks, Advisory Service for Squatters and various community/housing/anti-gentrification groups, seem aware that, although their action predates the crisis, they will increasingly be responding to crisis-related conditions. The Hackney Solidarity network has called a wider meeting to discuss what to do about this. It will be important to see whether they are able to overcome what can sometimes be a limiting contradiction in this kind of community-based working-class activism, i.e. that the focus on the local community (sometimes with the implication: settled local community) can be so intense as to tend to exclude those who, precisely by virtue of the conditions in work, housing and migration over the recent years, are unable to 'settle' into any 'community' throughout their lives. There hasn't been much sign of more assertive class struggle since the answers above were written, although that may not be so strange given that already at the time it was mostly a matter of long-term tendencies starting to show their ugly face. The most dramatic developments have been unhappy (unless you buy the idea that immiseration automatically = antagonism) and unsurprising. As has been widely reported in mainstream media, the wave of business insolvencies and pre-emptive redundancies has spread from banking into retail chains and what was left of manufacturing (such 'National Champions' as Royally-approved makers of decorated porcelain crockery). Most media coverage and government spin continues to attribute these business failures and job losses in a disingenuously direct way to consumers' alleged sudden unwillingness to spend: reference to the leveraged leverage through which even small businesses are 'owned' and which can no longer be 'rolled over', and to supply chain breakdowns (eg. 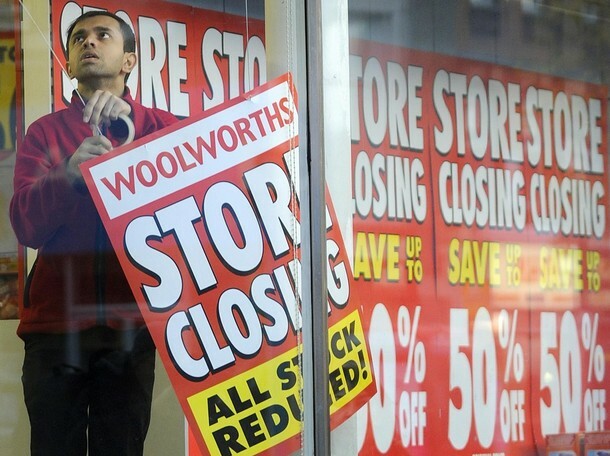 the bankruptcy of the Woolworths chain bringing down ex-Virgin retailer Zavvi because Woolworths was its main wholesale supplier) are restricted to the financial pages, and 'credit crunch' debate is almost all framed in terms of lending to consumers and mortgagees. It's hard to get a general idea of how widely this skewed focus is accepted. One micro-example: the small (a few hundred workers), private equity-owned press cuttings agency where I work stages occasional 'employee forums', announcing business results and taking pre-submitted questions; my question about the chances of refinancing debt incurred in the recent private equity buyout was refused on grounds of private equity privacy, then the forum was cancelled. Meanwhile there's quite a bit of concern expressed among workers about the chances of the business surviving, but almost always in terms of how much work is coming in from clients, rather than vulnerability to financial events elsewhere. One thing that does seem clear though is that the job losses have barely started, so the media emphasis on passing phenomena like Christmas sales is misleading. Of course statistics from ratings agencies are not the point, but it's still worth noticing that in November 2008 Standard & Poor's calculated the 'speculative grade' corporate debt default rate for Europe at 3 per cent, but the forecast for all of 2009 and 2010 is 8.7-11 per cent. Perhaps the most depressing news in terms of implications for class struggle has been that of large bodies of industrial workers volunteering (through unions of course) for substantial wage cuts in desperate bids to save their jobs. This happened late last year at JCB, then the company laid hundreds of workers off anyway; the GMB union still tried to claim it as a victory on the grounds that more workers would have been sacked otherwise. Shortly afterwards (December) the Financial Times reported that GMB workers at steel maker Corus (Tata group) had offered to take a 10 per cent wage cut to keep their jobs; the union denied this at first, then it went through on a plant-by-plant basis. Meanwhile Tata is asking for a state subsidy to 'save jobs' at Jaguar-Land Rover, the Midlands car maker it recently bought at a premium as a 'trophy asset'. Reports this week of business complaints about the cost per worker of imposing outright redundancy suggest that more moves to sidestep the problem by cutting wages and/or hours could be on the way, although this hasn't happened yet on the same scale as in some other countries. Nissan had already been cutting shifts back at its 'most efficient in Europe' etc Sunderland plant, which had moved onto round-the-clock work in Janauary 2008 and was still running on that basis in June; just yesterday though it announced 1,200 redundancies: 400 temp and 800 'permanent' workers. There have also been some signs of use of crisis conditions as a pretext to attack recalcitrant groups of workers: thus Peter Mandelson, an unpopular member of Blair's inner circle, was brought back from Brussels as a sort of crisis-toubleshooter, upon which he immediately decreed the part-privatization of the strike-prone Royal Mail, something which has been a policy goal for years but had until now been impossible to push through. The 'return to Keynes' (Man of the Year in Rupert Murdoch's Times) continues to be proclaimed everywhere, in a way that's puzzling unless 'demand management' is to be understood so literally that desperate repumping of a lending and asset price bubble counts: base interest rates have been cut so far below inflation as to wipe out middle class pensioners' paltry income from savings accounts: the solution proposed tentatively by the government and loudly by the pensioners' Tory 'defenders' is to cut taxation of said savings, thereby adding to the 'necessity' for qualitative (i.e. public provision) austerity in a few years to pay for quantitative (i.e. helicopter money) 'stimuli' now. A little-noticed state move (legislated pre-crisis) to ensure the continued expulsion of the working class from urban centres where land prices might be expected to rise, notwithstanding a burst real estate bubble, is just getting underway now: housing benefit (i.e. state subsidy of inflated private rents) is to be paid based on average rents across large, mixed-income swathes of territory, rather than according to rents on particular properties, as was the case until now. So that even in a 'market downturn', claimants receiving a 'Housing Allowance' calculated based on the 'average' across a wide area will be priced out of gentrifying enclaves where rents are above that average, whereas the previous system, with the benefit paid according to the particular rent, slowed the class purge somewhat even during the real estate 'boom'. More generally, the institutional expectation of long-term mass unemployment is probably most evident in the unprecedented punitive measures (FULL TIME supervised job-search; explicit comparisons to 'school detention' and to 'community service' sentences in the 'criminal justice' system) against dole and sickness benefit claimants announced in the 'Queen's speech', i.e. scheduled to be legislated into force some time within the next two or three years.